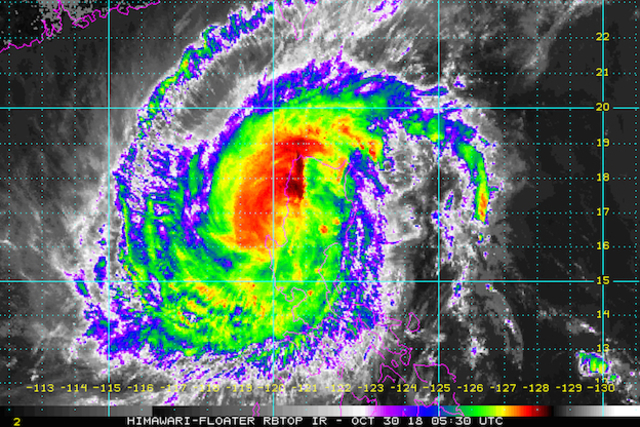 Typhoon Rosita (Yutu) has weakened and moved towards the West Philippine Sea Tuesday afternoon, Oct. 30. It made landfall in Isabela early Tuesday morning and went out of the province of La Union at 2 p.m. It was located 125 km northwest of Dagupan City at 4 p.pm. Based on PAGASA’s 5 p.m. weather bulletin, Signal No. 3 is still raised in Pangasinan and La Union. PAGASA warned that traveling to these areas by land is dangerous. A storm surge of up to 3 meters is possible in the coastal areas of Ilocos Sur, La Union and Pangasinan.